Book Creator is a free online eBook creator with options to embed audio and video to eBooks. 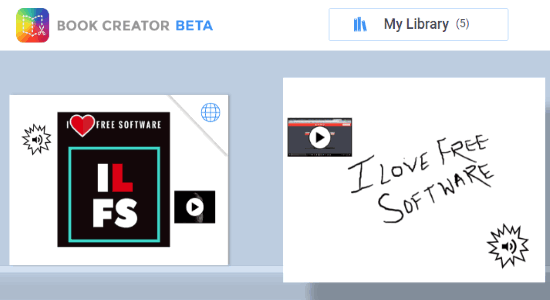 It lets you easily create eBooks by adding various elements like images, text, drawing, stickers, shapes, etc. Unlike other online eBooks creators, you can also make your eBooks interactive by embedding audio and videos. You can either import existing audio and video files from your PC to embed or record new using the built-in audio and video record options. 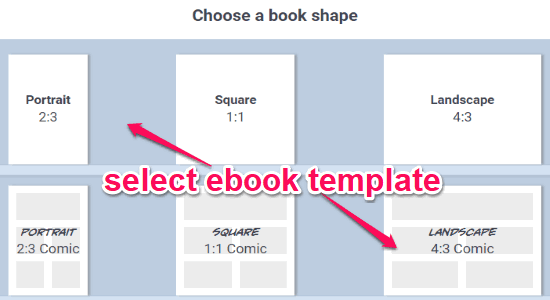 You can start creating an eBook by selecting any of the plain or comic predefined templates. Then you can add as many pages as you want to your eBook, along with a cover. After that, you can go ahead and add all the supported elements to the pages. Once done, you can publish the eBook online and share the URL with others. You can also present your eBook in full-screen mode using the “Play” option. Note: Currently, this online eBook creator is in beta, so some of the important features like collaboration, custom library, etc. are yet to come. The eBook download option also doesn’t work in this beta version. To get started, simply open up the homepage of Book Creator and create a new account. After that, it will ask you to choose any of the predefined eBook templates (plain or comic) among Portrait, Square, and Landscape. As soon as you do that, the eBook editor will open up and you can start adding elements to the pages. First, the cover page will appear which you can design in any way you want. Then you can proceed to add pages and start editing them individually. To add a page, all you gotta do is click on the “+” button visible on the right of the currently opened page. When you’ve added a page, simply click on the “+” button at the top to add elements. You will see three different tabs named, Media, Comics, and Shapes. 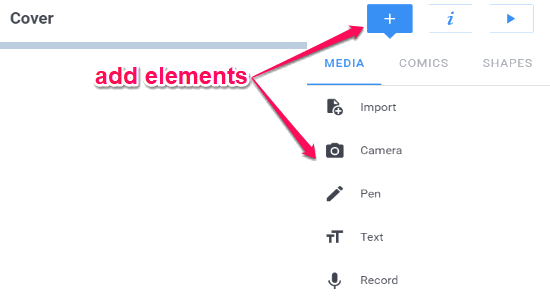 After you select the “Media” tab, you will see the options to import media files, record webcam/screen, add a drawing, add text, and record audio, as shown below. Now, let us take a brief look at all the options under the “Media” tab. The “Import” option will allow you to add existing images, audio, and video from PC to your eBooks. You can click on the option and then choose any media file from PC and then it will automatically embed it on the page. The “Camera” option is one of the most important options of this online eBook creator. Using this option, you will be able to record new videos and take new photos and embed them to eBook. 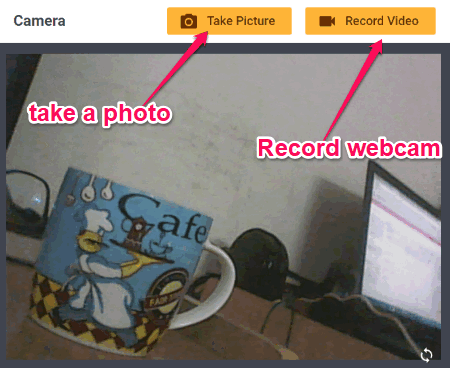 If you have connected a webcam, then selecting this option will allow you to record your webcam or simply take a photo. When you’re done recording a video or taking a picture, it will be embedded automatically to the selected page. 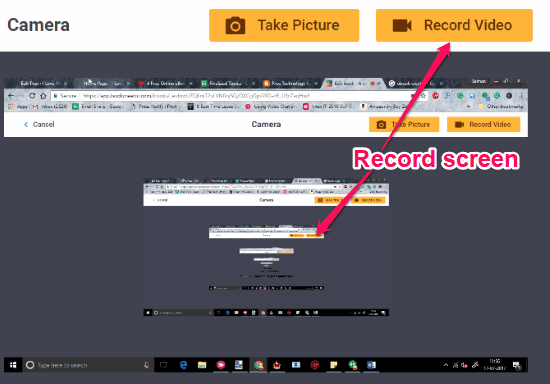 In another case, if you don’t have a connected webcam and you select the “Camera” option, then instead of recording your webcam, it will record your screen. That means disconnecting your webcam will allow you to record screen activities and embed the resulting video to the eBook. To add a drawing, you can simply select the “Pen” option under “Media” tab. 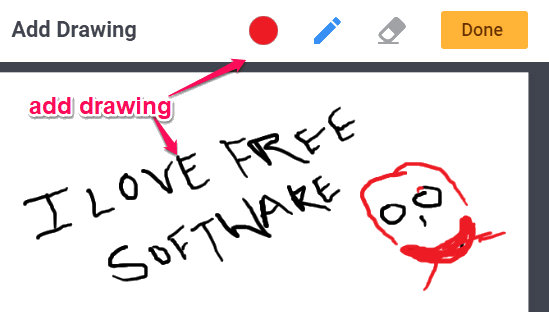 As soon as you do that, it will allow you to draw anything on the page with the free-hand brush. You will also see the option to change the brush size, brush color, and an eraser to make corrections. It also allows you to add text to the pages. For this, you can select the “Text” option and then a popup dialog will appear where you can type anything you want. You can also make the text bold, italic, add underline, and also add a hyperlink to the text. The last option which can you see under the “Media” tab is “Record”. Selecting this option will allow you to record audio using the microphone. That means this option can come in handy if you want to embed a voice over to the eBook. If you want to add comic elements to the eBook, then simply go to the “Comics” tab. There you will see the options to add comic panels, speech bubbles, thought bubbles, comic text, and comic stickers which you can add to your eBook. It also allows you to add various shapes to your eBook like a rectangle, circle, arrow, triangle, etc. 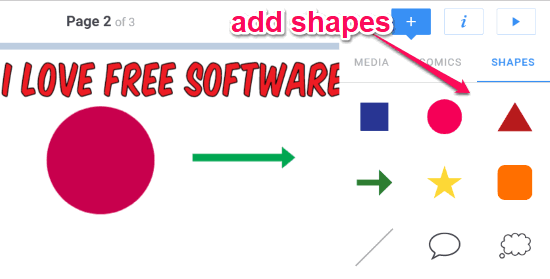 To add a shape, select the “Shapes” tab and from there you can click on any of the shapes to add it to the page. Apart from all these features, this online eBook creator also allows you to change page background, move elements, rotate elements, resize elements, change text font, text size, text color, and so on. When you’re done creating your eBook, you can simply click on the “Play” button at the top right corner of the editor to present your eBook as a slideshow. You can toggle full-screen and play the eBook slide show manually by clicking the arrow icons on the left and right. You can also choose whether you want to play the eBook by one-page template or two-page template. At the top, you will also see the option to share and save the eBook online. To do this, simply click on the “Share” icon and then select the “Publish” option. A soon as you do that, the eBook will be saved online and you will get a URL which you can use to share the eBook with others. There will also be an option to download the eBook, but unfortunately, it doesn’t work in the beta version. Book Creator is probably one of the best online eBook creators. The option to record and embed audio and video to the eBook makes it unique and distinct from other similar websites. Personally, I think this free eBook maker is perfect for creating interactive eBooks, but it would have been better if it allows you to collaborate with others, download created eBooks, etc. Hopefully, the developers will add these features in future. Try “Book Creator” from here.